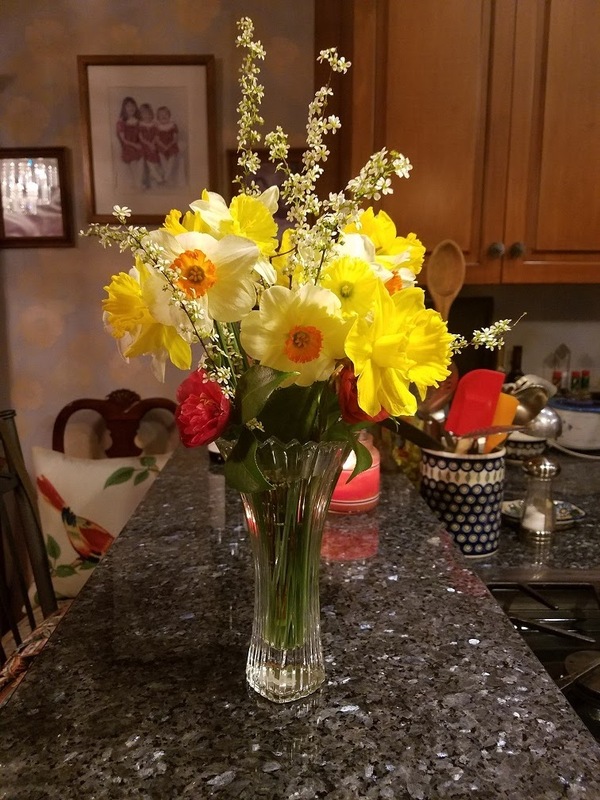 Spring flowers from our yard are earlier than usual so Bev made a bouquet. While Cindy now lives with us, she continues in her job as house/pet sitter and recently brought one of her charges over here to meet our pups. He is a really big Golden Doodle named Barley and is roughly middle aged so still playful. 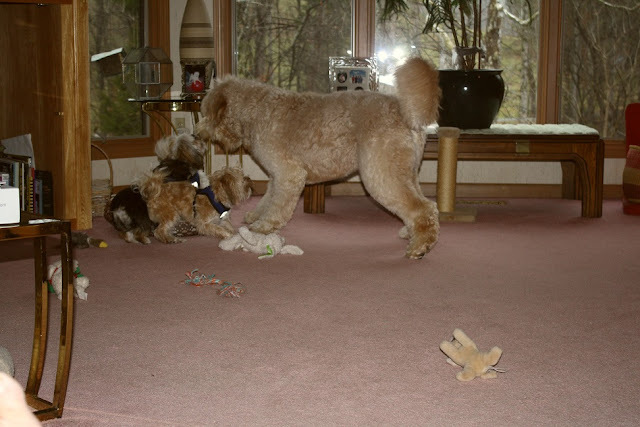 After a period of adjustment to the new dog, it was playtime and Pat’s dog, Frankie, who believes everything on the planet is a toy for him was soon on the attack, trying to jump up to Barley’s face and do what dogs usually do mouth-to-mouth, but he was just too short. 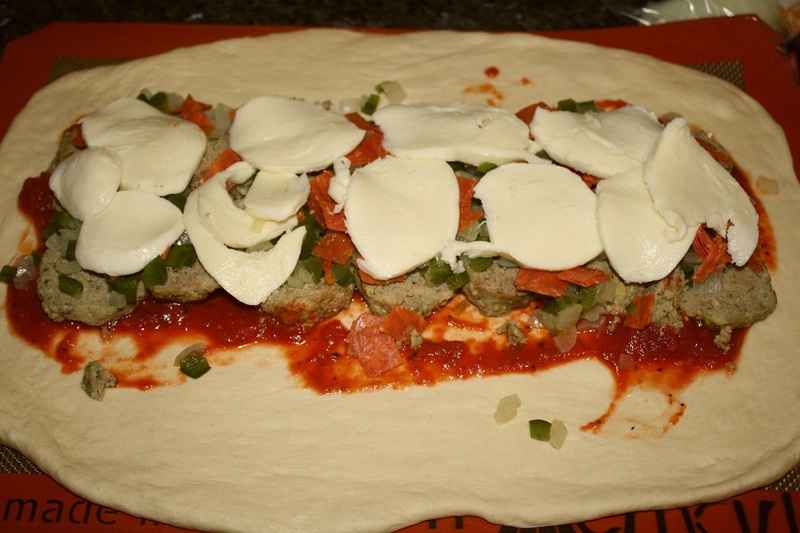 Bev had bought some refrigerator pizza dough and suggested calzones for supper to which I counter-suggested Stromboli which I had been wanting to make – basically the same thing in a different shape. Bev had frozen some homemade meatballs so we opted to use them along with some pepperoni, onions, peppers, tomato sauce, and fresh mozzarella. Here it is before baking and before braiding the top. When I was a kid, my mom made these sandwiches for us at lunch (we came home from the neighborhood school for lunch) and they were always a hit. After I made them for Bev and me several years ago, she also became a fan. 1. Nuke the ham slice to warm it a little then build the sandwich – bread, ham, cheese, tomato, onion, seasonings. 2. Bake in the toaster oven at 350 for about 10 minutes or until cheese begins to melt, then run it trough one toast cycle to finish cooking. 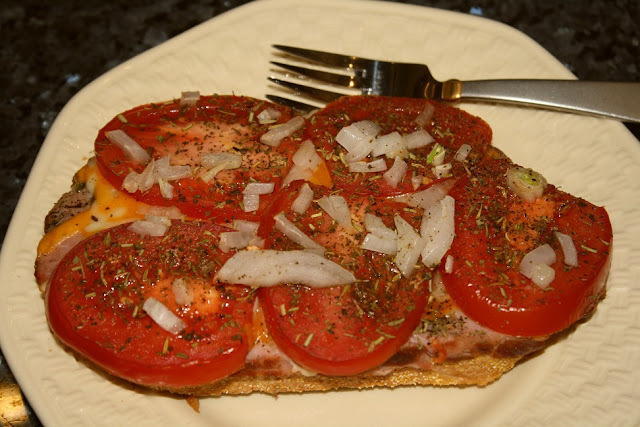 Note: The stacking order is important to ensure the onions and tomatoes cook some. If you want the cheese on top, just wait and add it after the toast cycle then broil it until melted. The sandwiches were delicious and, of course, would be even better with tomatoes right off the vine. My next one will have a couple of ever easy eggs on top. 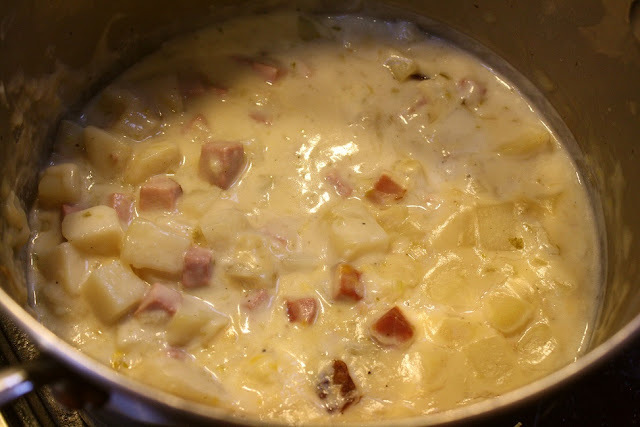 We had some ham in the fridge that needed to be used and, again, opted for ham and potato soup using the recipe from Allrecipes. The first time we made it, I didn’t think it had enough goodies, so we added more ham and potatoes this time. Serve immediately topped with your favorite garnish. 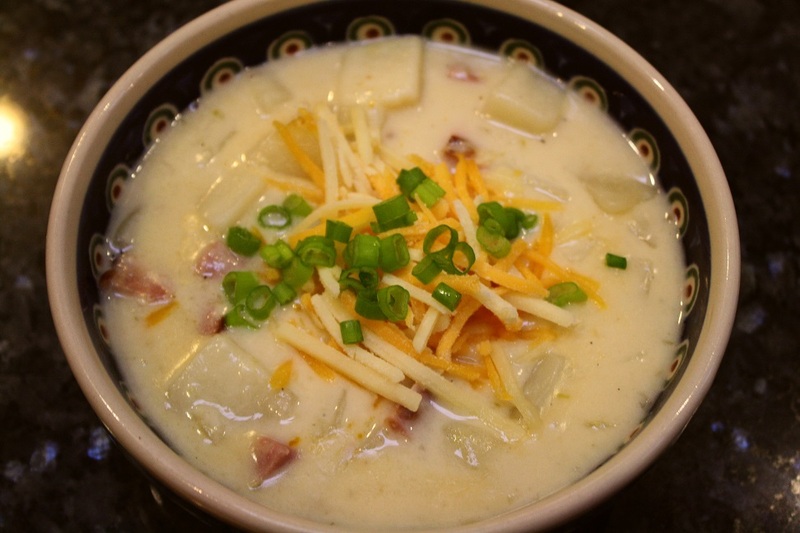 We all thought this was a very good version of a pretty basic and easy soup. 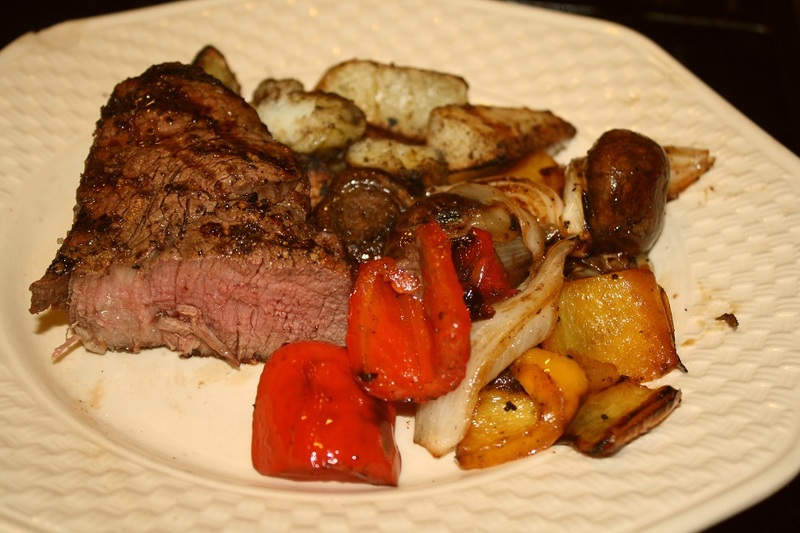 I once again completed the never ending re-organization of the freezer the other day and came across a couple of nice beef filets that were dying to be grilled and Bev wanted one of her favorites – grilled veggies. We didn’t have room in the grill pan for everything so the potatoes just went on the grill grates. 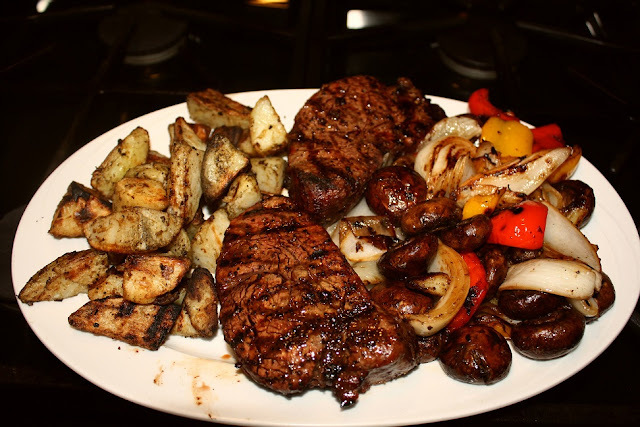 The steaks got a nice coating of Montreal Steak Seasoning, the potatoes were tossed with oil and dusted with Cajun Seasoning, and the remaining veggies were tossed with Good Seasons Italian Dressing. I'd tell you more about the Cajun Seasoning but it was the secret recipe from Angelle's Ice Cream Shoppe & Grille in Breaux Bridge, LA and while they sold it, their labels had not yet arrived - so I don't know it's name nor ingredients, but it has a kick. Here is the platter after arriving in the kitchen and Bev's plate - I like my steak more rare but this was perfect for her. Cindy is not a cook and not used to eating like we do, so after trying the veggies, she said OMG several times. She doesn’t eat much red meat but said the steak was delicious as well. We all thought it was very good and Bev got her grilled veggie fix - hard to beat good ole basic grilled fare, especially when you have a 60 degree January day to cook it.